Home Videos World WTH Seriously? - A Cross-Eyed Opossum Gone Viral? Seriously? - A Cross-Eyed Opossum Gone Viral? Sometimes I think it's the strangest and most bizarre (or maybe even completely inconsequential) things that spark my interest - you know what they say... small things amusing small minds, and all that? 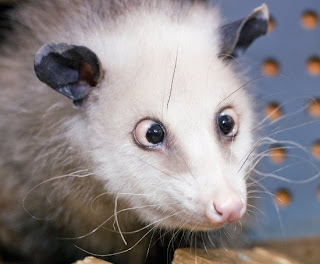 This article reeks of insignificance, and I have no idea why a cross-eyed opossum is so intriguing - but I actually somehow find it strangely amusing. We know most people love a cute animal and many others enjoy looking at an odd one... so it figures that statistically there will be an audience that will get an absolute treat by watching the internet's latest star - Heidi! The marsupial with misaligned eyeballs has become an online hit since it first arrived at Leipzig Zoo in Germany earlier this year. Heidi will not be on display to the public until July, but until then, photos and videos of the furry and whacky creature have gone viral. Also, her Facebook page already has around 70,000 fans. Checkout the German news video of Heidi, the very bizarre music video and a few pictures below. More information on Heidi can be found here!